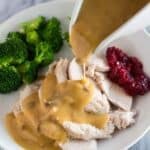 Homemade Turkey Gravy is so easy to make and absolutely delicious, especially when you use the leftover drippings from your Thanksgiving turkey. 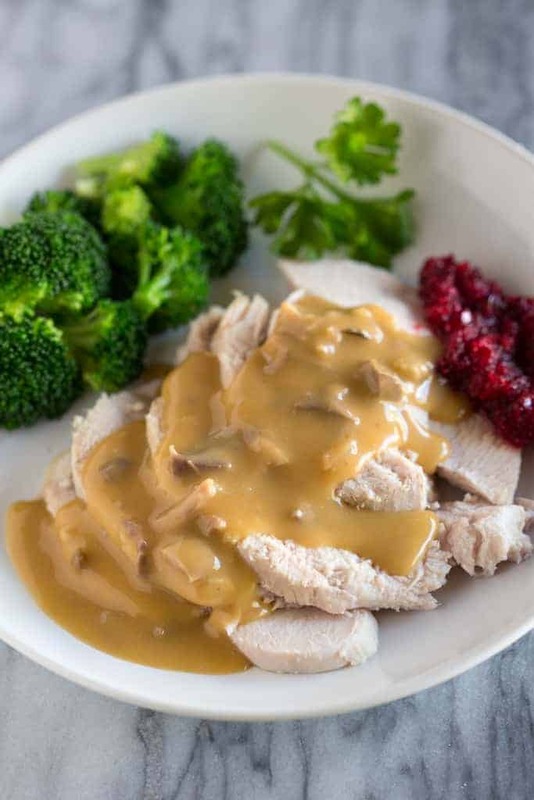 You can embrace the giblets stored inside your turkey and use the them to make a delicious giblet gravy, or leave them out if you want a turkey gravy recipe without giblets in it. We had TWO turkeys at Thanksgiving dinner when I was growing up. My mom usually hosted and we’d always have at least 30-50 people there. Mom would make one turkey and my Grandma would make the other, and they would both use the turkey drippings to make the best homemade turkey gravy! They say the star of Thanksgiving is the turkey, but I’d argue that the Turkey Gravy and cranberry relish really make or break the meal! I’m all about “sauces” and dips and those two things are top favorites on my entire Thanksgiving plate. I love to make a big well in my mashed potatoes for the gravy, I love it over my Turkey, and I love it lightly drizzled on stuffing. Everyone always loves a smear of leftover gravy and cranberry sauce on our turkey sandwiches the next day, too. Homemade gravy is so easy and delicious. Below are steps for making turkey gravy with or without the giblets. 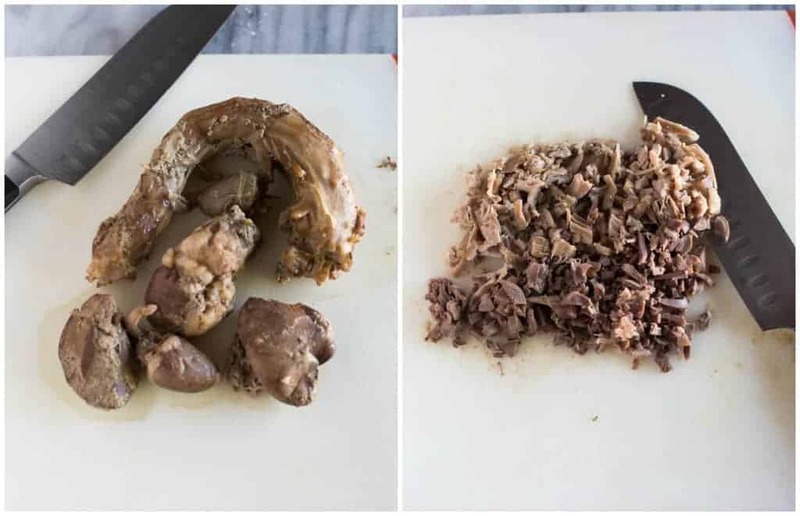 When you buy a turkey (or chicken), you will find the neck, heart, liver, and gizzards from the bird stored inside its cavity. Before cooking your turkey, you should remove the giblets and set them aside. You can use the turkey giblets to make the best homemade turkey giblet gravy! Drippings are what’s left in the roasting pan after cooking the turkey. This includes fat that has melted and any bits of meat that have fallen off. When you remove your giblets from the turkey, rinse them with cold water and store them in a ziplock bag in the refrigerator until you are ready to use them. When you are ready to make your giblet gravy, place all of the neck, heart, liver, and gizzards of the turkey in a sauce pan, cover them with water and bring it to a boil. Simmer the giblets 1 hour. Remove the giblets, save the water, and chop the giblets into small pieces. When you have taken your turkey out of the oven, pour the drippings into a bowl. Allow the fat to separate and skim it from the top of the drippings. Add about one cup of the drippings to the roasting pan or a sauce pan. 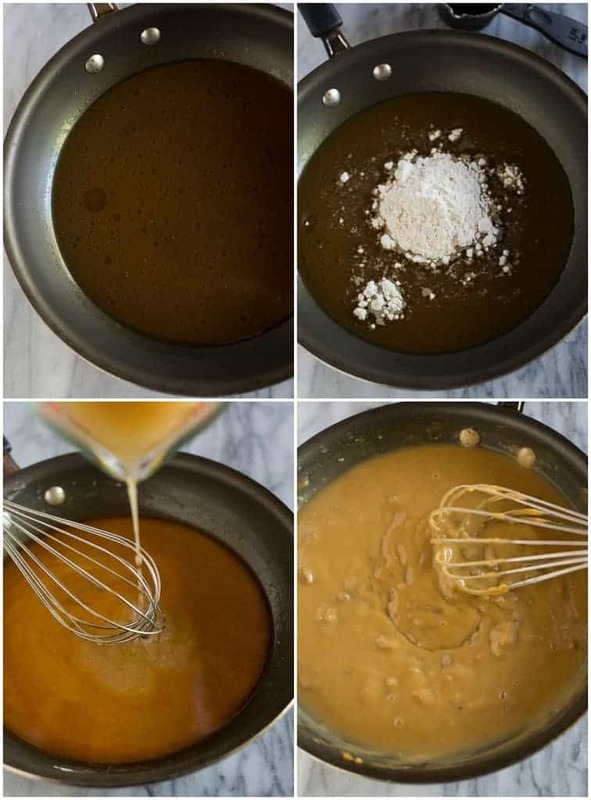 Whisk in about 1/2 cup of flour and make a roux by allowing it to turn to a golden brown color. Add broth and more drippings, stirring until it thickened, and add the giblet meat. Season the gravy with salt and pepper and make sure to taste it to be sure it has the flavor you are looking for! To make turkey gravy without giblets, throw the giblets from the turkey away and make turkey gravy using the drippings from the pan. Homemade Turkey Gravy is so easy and absolutely delicious. 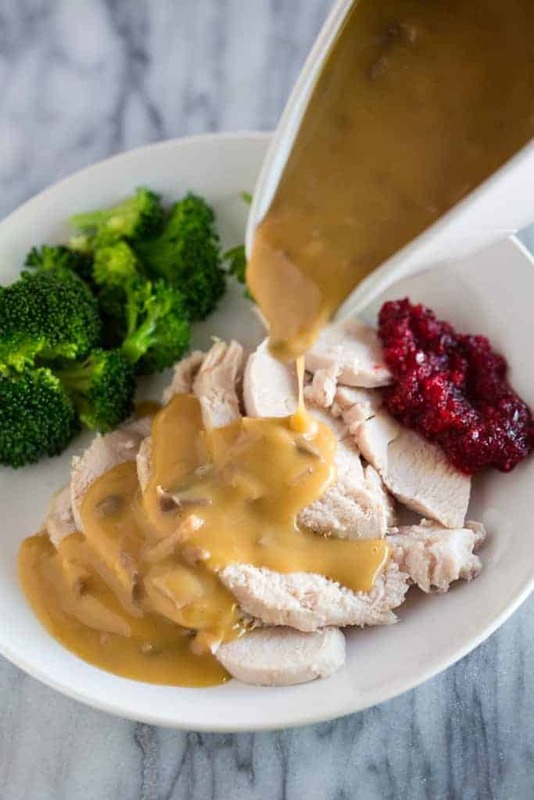 It's time to embrace those giblets stored inside your turkey or chicken and use the giblets to to make this delicious from scratch giblet gravy recipe! Place the neck, heart, liver, and gizzards of the turkey inside a medium size sauce pan. Cover the giblets completely with water and bring the water to a boil. Once boiling, simmer for 1 hour or until the meat is cooked through. Next, use a slotted spoon to remove the giblets from the water and set them aside. Once the giblets have cooled, remove the livers and discard them (they add a really strong taste and flavor not many people like). Use your fingers to remove any meat from the turkey neck. Add the meat to the rest of the giblets and discard what's left of the neck. Then dice the giblets into small pieces and reserve them for the gravy. When you have taken your turkey out of the oven, pour the liquid and drippings from your turkey roasting pan into a large bowl. (Tip the pan away from your body and be careful not to burn your self)! Now let the drippings sit for a minute, allowing the fat to naturally separate from the rest of the drippings. You will notice that the fat will rise to the top, leaving the drippings and liquid on the bottom. Use a large spoon or ladle to skim (remove) most of the fat from the top of the the drippings. To make the gravy, use a large sauce pan and add 1 cup of drippings to the pan. Add 1/2 cup flour to the pan and whisk together until it makes a smooth paste. (At this point, you'll need to use a little of your own judgement. You want a pasty consistency. If yours seems a little greasy, add more flour). When you have found the right consistency, whisk the mixture slowly over the heat as it begins to brown. You are creating a roux. Once you get a nice golden brown color, add 4 cups of chicken broth and 1 additional cup of drippings. If the gravy is too thick, add more broth or drippings liquid. 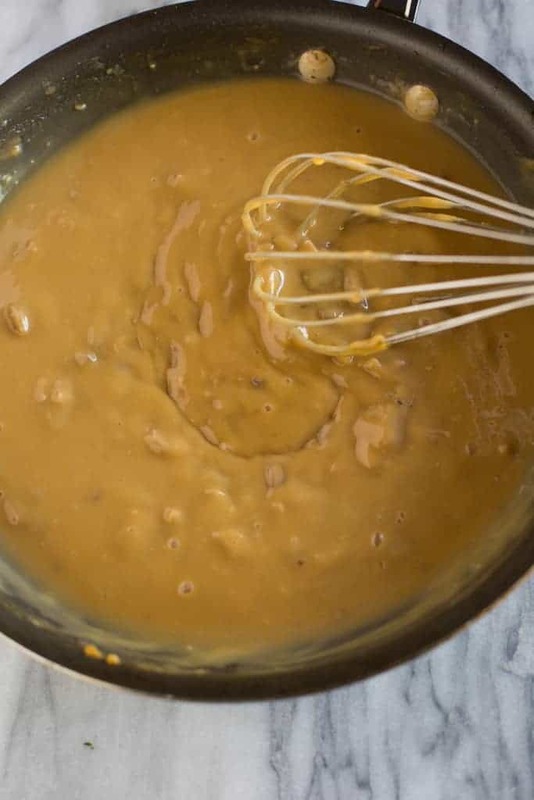 If gravy is too thin after cooking for 10 minutes, add a cornstarch slurry (mix 1 tablespoon of cornstarch with 1 tablespoon of water and then add to the gravy). Once your happy with the consistency of your gravy, season with salt and pepper, to taste, and enjoy! Store leftover gravy covered, in the refrigerator. Find all THANKSGIVING recipes HERE. This recipe looks so amazing! I have never, ever in my life had to cook a turkey, ever. To say I am a bit nervous is an understatement. I have a couple questions. I think I need to brine my turkey, what are your directions on that please, because sadly I have never done that either. My mom usually does the cooking of the turkey, but she passed away Sept 2017. Last year no one felt like celebrating so we had it catered. This year I am attempting to fill her shoes. Also I have to cook and carve it at my house then drive it about 10 min way. How to carve the turkey, I do not have an electric knife. Is it okay to do the cranberry relish in a blender as I do not have a food processor? I have a 12 pound turkey, at what temperature and how long do I need to cook it? I am sorry to bother you with this questions, I would give anything to be asking my mom, but I do not have that option, so any insight you could give me would be appreciated. God Bless you and your family! It’s a great resource, and here is a link to a live video I did on facebook this week walking you through the entire process, and answering questions: https://www.facebook.com/tastesbetterfromscratch/videos/1485697671533369/ ! I do NOT brine the turkey–it’s very unnecessary if it’s a good-quality store-bought turkey (like butterball)–they are pre-brined these days. As you’ll see in my post, turkey’s take about 13-15 minutes to cook per pound and they cook at 325 degrees F, so you should plan on about 2 1/2 to 3 hours to cook your 12 pound turkey. Also, Pulsing the cranberry relish in your blender will work really well! Be sure to cut the orange into pieces. Your 10 minute travel time will work perfectly for the turkey, which should really rest for at least 20-30 minutes before carving anyways 🙂 Cover it well with tinfoil while it rests to keep it warm. Good luck and I would love to hear how it goes! I just have a quick question about the turkey gravy.. Since you’re getting the drippings from a hot turkey, do you not need to apply heat to the saucepan when adding the flour and added drippings for thickness? I just wasn’t sure if there was any extra heat there or not. Thank you! Best turkey gravy I’ve made! Thank you! I made this for yesterday’s meal and we all loved it! I just didn’t tell anyone what the bits were! Thank you for such an easy simple but delicious recipe! Tried the Turkey gravy without giblets and it was a success. Very happy with it. I needed to tweak the flour for more servings which made it a bit hard since I’m not a great chef and have little cooking experience with making things from scratch. OKay honestly I never leave comments. Like ever. However, this recipe was simply amazing. If I could give it 10 out of 5 stars I would. Thanks so much for sharing this! I’ll be using this every year from now on! Best gravy I’ve ever made, and it was just as easy as using a packet. Thank you for the clear instructions. If you are boiling the neck, heart, liver, and gizzards of the turkey, does that become the 4 cups of broth or is the 4 cups broth added in addition? No, I use a separate 4 cups of broth and only use the left over liquid from the giblets if you need to make it thinner near the end of cooking! “We had TWO turkey’s at Thanksgiving dinner …” You may note that even Grammarly marked “turkey’s” as incorrect since the plural form would have no apostrophe. It ain’t rocket surgery.